A new study from the Centers for Disease Control and Prevention estimates that roughly 1 million Americans are treated annually for a common type of eye infection, most often caused by improper contact-lens care. According to the CDC, since 2006, the U.S. has seen three outbreaks of Fusarium karatitis and Acanthamoeba karatitis, two types of eye infections that can lead to blindness in serious cases. Karatitis is a corneal infection that can cause redness, blurred vision and irritation of the eye. Blindness caused by karatitis is rare and typically only occurs in very serious cases. Medical epidemiologist, Jennifer Cope, says that taking poor care of contact lenses is the biggest risk factor for developing karatitis. The infections are relatively straightforward to cure when caught early, but can become a nuisance if left untreated. While skipping a few easy-to-neglect steps in lens care, such as regularly switching out lens cases, can save a little money in the short term, hospital costs could give penny-pinchers pause. The CDC reports that the average doctor’s visit to treat karatitis is about $150, and the average emergency room cost is around $590. The annual cost of treating karatitis in the U.S. is roughly $175 million. 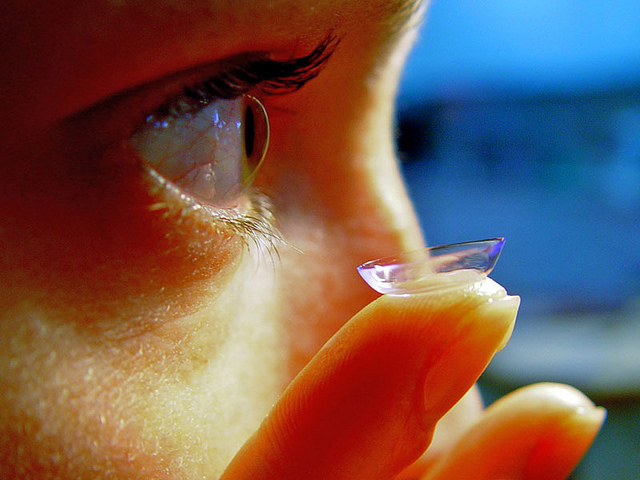 The CDC cites negligence and poor hygiene as the main culprits behind the high cost and number of eye infection cases caused by contact lenses. Overnight lens wearers are over 20 times more susceptible to eye infections, says Cope. Of course that does not account for contact lenses designed to be worn overnight, though even extended-wear lenses should be taken out regularly for cleaning and to rest the eyes. The American Optometric Association (AOA) recommends using only solutions that have been approved by an optometrist to clean contacts. Rewetting drops and saline solution, says the AOA, should never be used to clean contact lenses. Soft lenses should be put in before applying makeup, and rigid gas-permeable lenses after. Lens Wearers should avoid lash-extending mascara and use an oil-free moisturizer. According to the AOA, more than 30 million Americans wear contact lenses, two-thirds of wearers are female and the majority is nearsighted. Eighty percent of contact wearers wear daily use soft lenses, more than 50 percent wear one to two-week disposable lenses and only 15 percent wear extended use soft lenses. A study from PubMed compares the effects of vision correction on the quality of life of three groups of people, the bespectacled, contact-lens wearers and those who have undergone refractive surgery. Those who elected to undergo the surgery scored much higher than those who did not, though contacts did rank higher than glasses. Anyone who cannot afford surgery, or fears its risks, should at least pay close attention to how they handle their contact lenses to avoid an eye infection, or cut the cause out altogether and opt for the more cumbersome choice of glasses, though glasses clearly have their setbacks.